Director of Research for The Center for Health Design. Research Manager, Skidmore Owings & Merrill. A large body of evidence attests to the fact that the physical environment impacts many essential healthcare outcomes including patient and staff safety, patient stress and satisfaction, staff effectiveness, the quality of care, sustainability, and healthcare cost. Just as medicine has increasingly moved toward “evidence-based medicine,” where clinical decisions are informed by research, healthcare design is increasingly guided by rigorous research linking physical environment to healthcare outcomes and is moving toward “evidence-based design” (EBD). Healthcare decision makers are increasingly aware of the benefits of incorporating evidence-based design elements into facility design. But, which key design elements should healthcare organizations consider as they embark on construction projects? Based on literature reviews conducted at The Center for Health Design (CHD), we have compiled a list of top 10 design features that are proven to impact multiple important outcomes in healthcare. The key criterion for inclusion was the strength of the evidence gauged by the number and quality of scientific studies supporting the linkages between these design features and healthcare outcomes. The following is a brief description of these design feature and their impacts on healthcare outcomes. The rank order is based on the strength of existing evidence. Depending on the type of healthcare settings and specific project goals, different types of issues might gain priority and some of these elements might move off the list and others take their place. Research clearly indicates that single-bed rooms, compared with shared rooms, may expedite patient recovery by alleviating patient stress, reducing the risk of transmission of pathogens originating from a roommate, reducing medication errors, reducing noise, improving privacy, improving sleep quality, and facilitating patient-staff communication. In addition to patients, healthcare staff also benefit from single rooms. Nurses in single rooms reported lower stress level and higher job satisfaction. Single rooms’ benefits have been demonstrated at many healthcare organizations including those participating in CHD’s Pebble Project research initiative. For example, Bronson Methodist Hospital in Kalamazoo, Michigan reduced infection rates by 45% when it switched from semi-private rooms to all single rooms. The reduction in infections resulted in significant operational savings that offset the initial capital expense of single rooms. The acuity-adaptable model is one example of single room design with the adaptability of providing multiple levels of care in one room to minimize the need to transfer patients as patients’ acuity level changes. At Clarian Methodist Hospital in Indianapolis, Indiana, single-bed acuity-adaptable rooms significantly reduced patient transfers, medication errors, and patient falls. 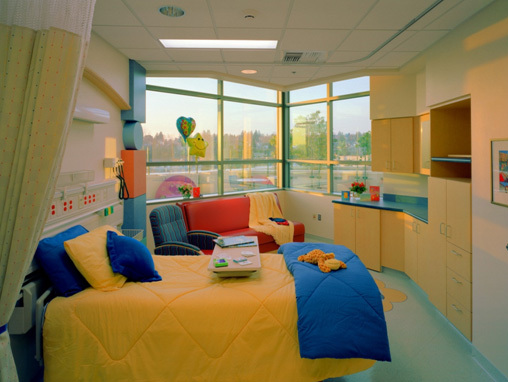 Because of the documented benefits of single rooms, the Guidelines for Design and Construction of Health Care Facilities, which is widely used as a code or standard for healthcare facilities in the U.S., recommends single rooms in all new hospital construction. Nature is a great source of positive distractions. Providing access to nature in healthcare settings has been proven to increase patient, family, and staff satisfaction, reduce stress and anxiety, reduce pain and pain medication use, and shorten patient’s length of stay. Healing gardens provide direct access to nature and a setting for beneficial escape and recuperation from stressful clinical situations. Positive mood change and reduced stress was reported within several post-occupancy studies of healing gardens. Much research demonstrates the significant benefits of window views of nature. An excellent experimental study conducted by Roger Ulrich found that patients undergoing abdominal surgery recovered faster, had better emotional well-being, and required fewer strong pain medications if their windows looked out onto trees than if their windows looked out onto a brick wall. As essential components of a healing environment, artwork and virtual reality with nature content can relieve stress for diverse groups of people. Studies showed that cancer patients exposed to virtual-reality nature images within their hospital rooms exhibited a reduced level of anxiety and symptomatic distress. Other studies revealed that using virtual reality as a distraction during clinical procedures resulted in fewer adverse effects and pains. Daylight and sunlight are critical to human health and can be extremely beneficial to patients as well as staff in healthcare settings. Exposure to daylight helps reduce depression among patients with seasonal affective disorders and bipolar depressions, decrease length of stay in hospitals, improve sleep and circadian rhythm, lessen agitation among dementia patients, ease pain, and improve adjustment to night-shift work among staff. Research reported that patients undergoing elective cervical and lumbar spinal surgeries who stayed on the bright and sunny side of a hospital unit reported less stress and pain, took 22% less analgesic medication, and had 21% less pain medication costs than patients cared in the dim side of the same unit. Myocardial infarction patients who were assigned to sunny intensive care rooms experienced significantly lower mortality than those patients assigned to north-facing dull rooms within the same unit. Research also revealed that daylight could reduce agitation among dementia patients, depression, and energy consumption. Hospital ventilation affects airborne transmission of infectious pathogens. Many incidents and outbreaks of nosocomial infections have been linked to malfunctions and contamination of the ventilation system in hospitals. High-efficiency particulate air (HEPA) filters are very effective (99.97%) in removing airborne pathogens as small as 0.3 micrometer in diameter and have been found to significantly reduce pathogen concentration in patient care spaces and healthcare associated infections (HAIs). Rigorous studies found that bone marrow transplant patients who stayed in HEPA-filtered spaces experienced significant lower incidence of Aspergillus infection and were more likely to survive. Based on the research evidence, the Centers for Disease Control and Prevention (CDC) and Healthcare Infection Control Practices Advisory Committee (HICPAC) recommended HEPA filters for healthcare facilities especially areas housing immunocompromised patients. HEPA filters can either be stand-alone portable units or integrated into the hospital heating, ventilation and air conditioning (HVAC) system. Many healthcare facilities have installed HEPA filters and reported significant reduction in HAIs. Noise in hospitals averages 45-68 dB and peaks at 85-90 dB, far exceeding recommended guidelines. The high ambient noise levels negatively impact patient and staff outcomes ranging from sleep loss, longer hospital stay, and elevated blood pressure among patients to emotional exhaustion and burnout among staff. Poor acoustics can pose a serious threat to patient confidentiality and privacy as well as impede patient-staff and staff-staff communication by rendering speech and auditory signals less intelligible or detectable. Sound-absorbing ceiling tiles are effective in improving healthcare acoustics by reducing noise reflection and reverberation. A recent study in Sweden revealed that the installation of high-performance sound-absorbing ceiling tiles in an intensive coronary care unit resulted in lower noise levels, shorter reverberation time, lower staff stress, and better speech intelligibility. Other studies reported that patient sleep patterns were better with sound-absorbing ceiling tiles in place. Patient lifting and handling is a major cause of healthcare staff injuries. A recent report indicated that 44% of injuries to nursing staff in hospitals that resulted in lost workdays were strains and sprains (mostly of the back), and 10.5% of back injuries in the U.S. were associated with moving and assisting patients. Reducing musculoskeletal injuries from patient lifting can not only result in significant economic benefits (reduced cost of claims, lost workdays) to healthcare organizations, but also alleviate pain and suffering among healthcare workers. Ceiling-mounted or mobile lifts are designed to assist patient lifting, moving, and handing. Ceiling lifts are more effective in reducing injuries and easier to use than mobile lifts. The success of ceiling lifts in reducing back injuries has been reported from many hospitals. For example, PeaceHealth in Eugene, Oregon installed ceiling lifts in most patient rooms in their intensive care unit and neurology unit and found that the number of staff injuries related to patient handling reduced significantly, from 10 in the two years preceding ceiling lift installation to two in the three years after the installation. The annual cost of patient handling injuries in these units was reduced by 83% after the lifts were installed. Surface transmission of pathogens accounts for many nosocomial infections. Low hand washing compliance among healthcare staff is a key factor contributing to this problem. Environmental factors that discourage hand washing include: difficulty of access, poor visibility, poor ergonomics, lack of redundancy, and wide spatial separation of resources that are used sequentially. Visible and accessible hand washing sinks and dispensers may increase hand-washing compliance. Handwashing sinks or dispensers should be clearly visible, within easy reach, with unobstructed access, placed at comfortable heights, placed in standard locations in all patient rooms and require minimal effort to use. Research suggests that increased number of well-located sinks and dispensers improves handwashing. Touch-free alcohol sanitizer dispensers may help increase frequency of use by healthcare staff. Nurses spend close to one-third of their time walking. Bringing staff and supplies closer to patients is likely to reduce time spent walking and increase time spent in direct patient care. Time saved walking can be translated into more time spent on patient-care activities and interaction with family members. Decentralized nursing stations and supplies adjacent to patient care areas (as opposed to one central nursing station per unit) have been found to reduce nurse walking, increase direct care time, improve nurse communication with other professionals, and improve patient monitoring. However, nurses also reported difficulty in communication with other nurses when working in decentralized stations. With decentralized nursing care becoming increasingly common, an opportunity exists to study the impact of this model on staff working efficiency and other related healthcare outcomes. As healthcare moves from simply treating disease to healing an individual in a holistic sense (physically, emotionally and psychologically), healthcare teams must work seamlessly together and include the patients and families as integral team members. Studies show that a physical environment that supports families’ participation in the care process may result in higher satisfaction among patients and families. Families are a great source of social support for patients. According to research, family presence in healthcare settings may help reduce patient anxiety and facilitate patient-staff communication. Providing spaces and amenities for families in the patient care spaces may support families’ presence and involvement in patient care. 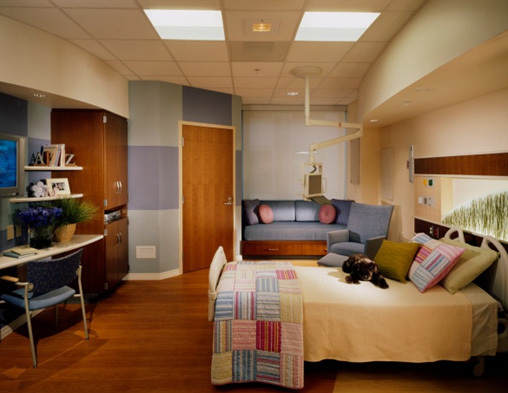 Single rooms have clear advantage over shared rooms in this regard due to increased privacy for patient-family interactions, more space and furniture to accommodate family presence. One excellent example of involving families in healthcare can be found at the Medical College of Georgia in Augusta, Georgia. Family members were the key advisors in design process of a new 20-bed unit, which provides ample space for families throughout the unit including space within each patient room with sofa beds, a family lounge, areas for quiet conversations (family consult rooms), and a small resource center. Stress among healthcare providers, especially with nurses, is a major problem contributing to nurse burnout and turnover. According to the Whole Building Design Guide and the Academy of Neuroscience for Architecture, there are recognized potential benefits for staff and caregivers in terms of satisfaction, effectiveness, and staff retention, from environmental factors such as: providing 'off-stage' areas for respite, proximity to other staff members, and appropriate lighting and the use of technology. Banner Health in Phoenix, Arizona provided large respite areas with window views of nature for staff in order to reduce caregiver stress. The Children’s Hospital of Denver, Colorado went beyond this and provided a concierge service for all staff to take care of everyday needs such as arranging car repairs, picking up dry cleaning, and sending flowers to loved ones. In addition, staff members were able to order take out from nutritional food services, take a shower after working out on the hospital campus, and securely lock bicycles inside the facility, all which promote a healthier lifestyle. The Center for Health Design (CHD), is a nonprofit research and advocacy organization that partners with forward-thinking professionals and organizations in healthcare, design, construction and product manufacturing who are leading the quest to improve the quality of healthcare facilities and create new environments for healthy aging. CHD’s mission is to transform healthcare environments for a healthier, safer world through design research, education, and advocacy. For more information, visit www.healthdesign.org. XiaoboQuan is a Research Associate and Anjali Joseph is Director of Research for The Center for Health Design. Amy Keller is a former Research Associate for The Center for Health Design and is now Research Manager with Skidmore Owings & Merrill.